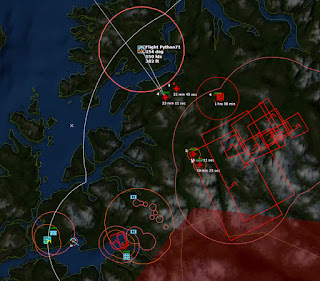 In Part One of this scenario, The USS John F. Kennedy and the USS Saratoga CVBGs advanced on northern Norway, their mission to destroy Soviet forces in the vicinity of Bardufoss and Banak, supporting the hard pressed NATO ground forces attempting to keep the Soviets from taking Narvik. 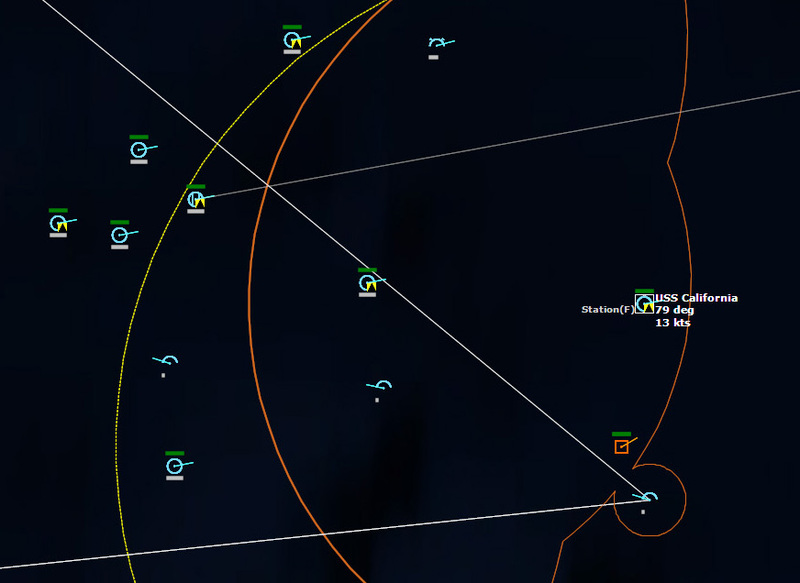 I wiped out a bunch of MiG-21s which foolishly came out to fight, and took out multiple Tu-95 Bear aircraft searching for me, and I think that so far the exact location of my CVBGs remains unknown. 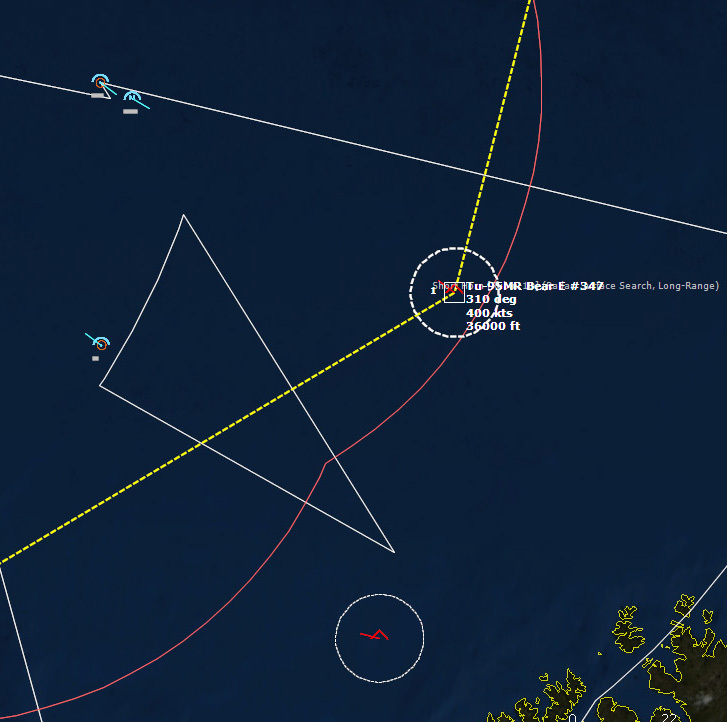 I managed a strike upon Bardufoss, causing limited damage, and I sank a Soviet submarine that got too close for comfort. 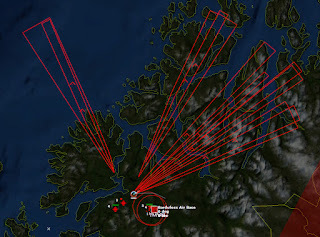 I need to keep up the pressure and prevent the Soviets from locating my CVBGs, because if I'm found, then they'll send in the Backfires and Badgers against me, and that's something I want to try very hard to avoid. 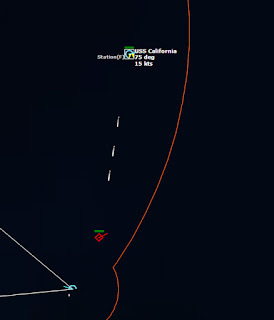 A merchant ship was discovered a while ago near the John F. Kennedy CVBG, and USS California now identifies it as the Castro, an unfriendly Commercial Supply Vessel. If it was friendly or neutral I would have left it alone, but not if it was unfriendly. Castro is declared hostile and California opens up with its 5" guns. It takes approximately a hundred shells, but the Castro, burning and flooding, eventually sinks. 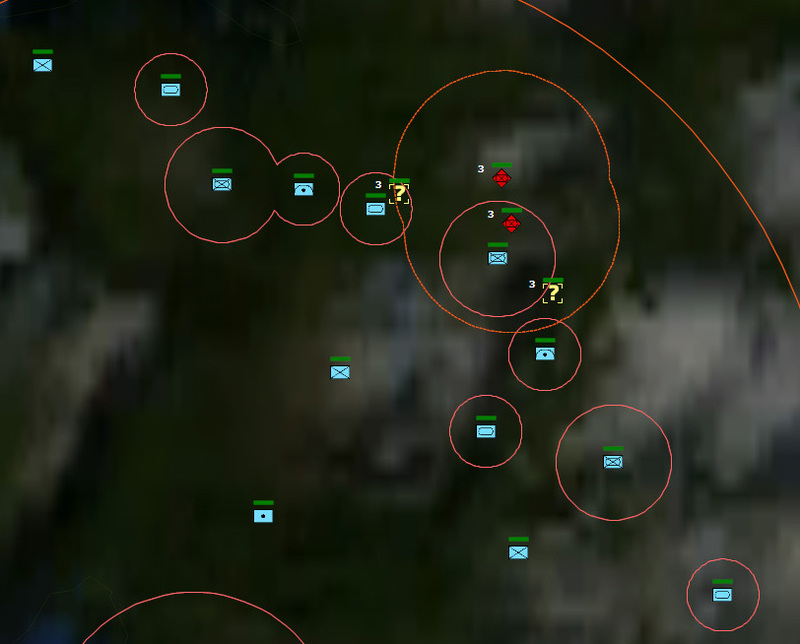 082535Z Soviet attack aircraft are detected over the 15th Infantry Brigade. 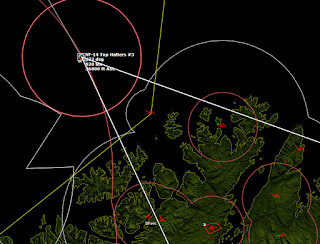 The aircraft are soon identified as MiG-23BN Flogger Hs, and they head for Evenes. The air defenses include a Rapier SAM Platoon and some 40mm Bofors AA guns. I lose contact with the bogeys momentarily, but then the Floggers pops up within SAM range, and the Rapier Platoon opens fire. One Flogger is shot down. The other continues its attack run, and drops bombs, damaging a Runway Access Point. Multiple SAMs go after it but miss. A second pair of Floggers appear, and the Rapier has its hands full launching SAMs. Both Floggers drop their anti-runway bomblets, starting a small fire and causing some light damage to the Runway Access Point and a Taxiway. 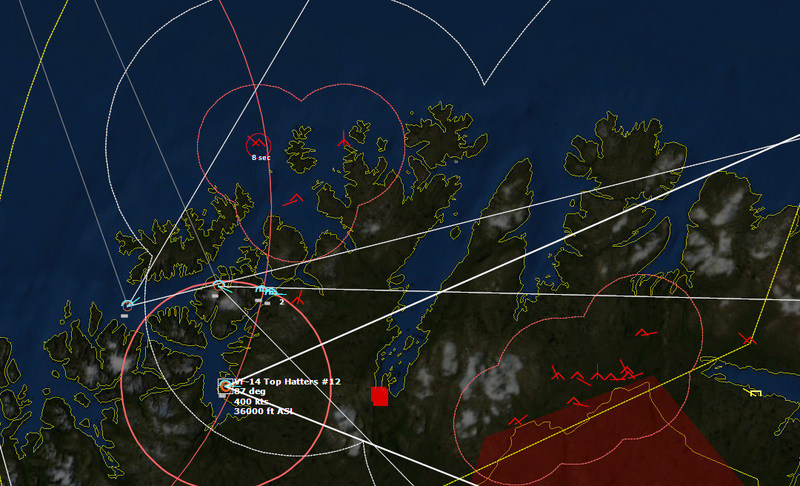 090000Z More aircraft are now ready on Saratoga, so I prepare and launch another strike on Bardufoss. 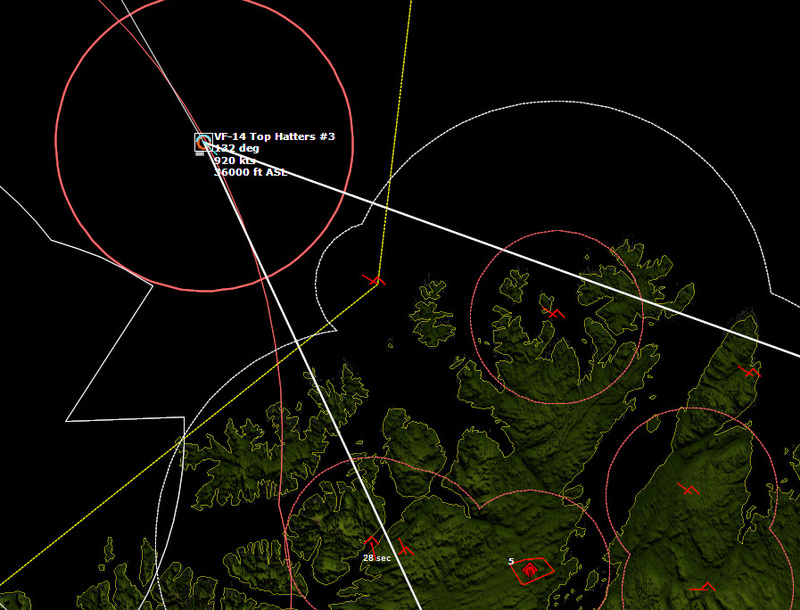 To scout out targets at Bardufoss targets, I launch my Recon Harrier from Evenes. 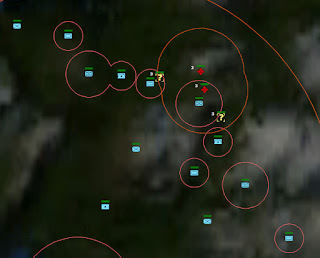 091149Z The Harrier locates an armor platoon, but also spots multiple aircraft. They are likely too far away to be of assistance, but I divert some of my CAP to investigate. Their radar emissions make me think they are more MiG-21s. 091346Z My suspicions are confirmed. My Harrier identifies one of the aircraft as a Fishbed, and goes low to evade. I send it back towards friendly lines in the hopes of keeping it alive. Four Fishbeds are in pursuit. My Harrier increases speed to full military power in the hopes of outrunning them. Now there are six Fishbeds in pursuit. My Recon Harrier is in deep trouble. I now detect eight Fishbeds in pursuit. The MiGs fire streams of bullets at the Harrier, but so far cannot hit it. I find that if I keep my Harrier jinking, the MiGs cannot keep up with the turns, but if I fly straight, the MiGs close the distance quickly. After lots of low-level maneuvering through the Norwegian mountains, my Harrier succeeds in making it over friendly airspace. 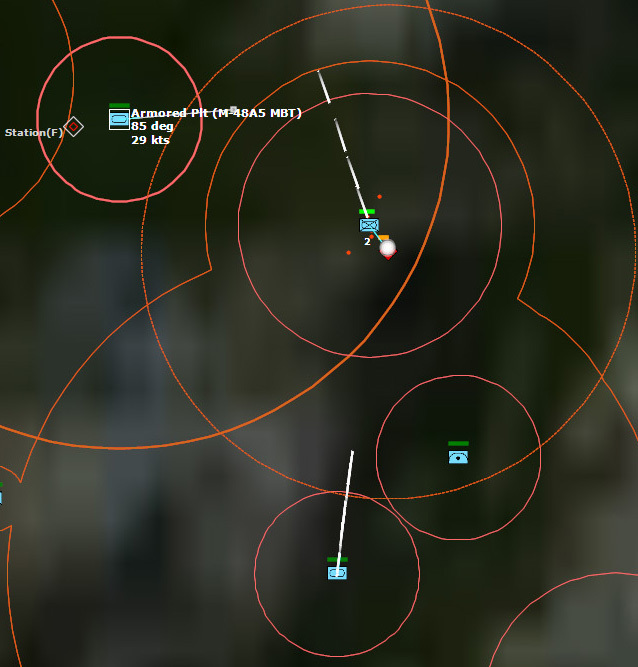 (this would have looked awesome in a movie...my Harrier was literally flying circles around the pursuing MiGs, at 500+ kts, 300ft AGL, in the mountains...) The MiGs choose not to follow, instead loitering some ten miles north of the 15th Infantry Brigade. 092712Z The MiGs get impatient, however, and soon they chase the Harrier directly over the NATO ground forces, which open up with ground fire. 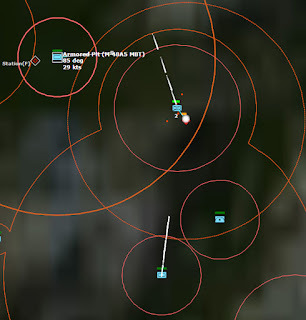 The Harrier lures them over the 42 Commando Blowpipe sections, and one of the MiGs is shot down. As my Harrier duels with the MiGs, Su-15 Flagons approach the area, and, hopefully unnoticed, a pair of A-7Es show up on the scene, ready to search for more Soviet ground units. 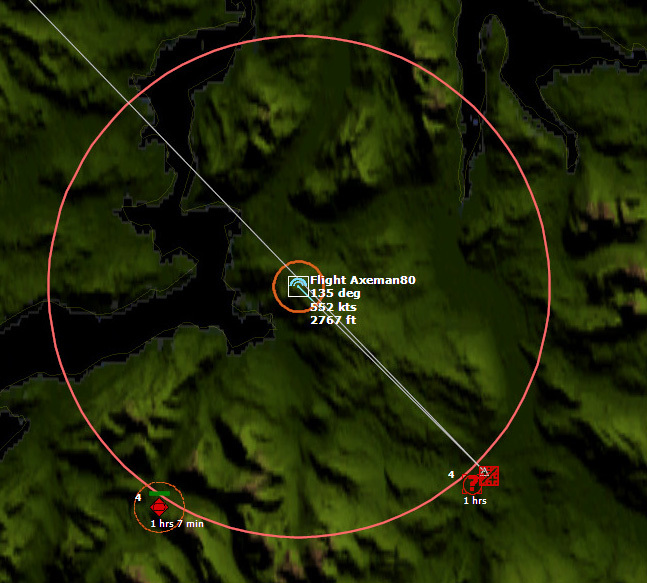 The A-7s make several passes over the area, but have difficulty spotting the tanks. 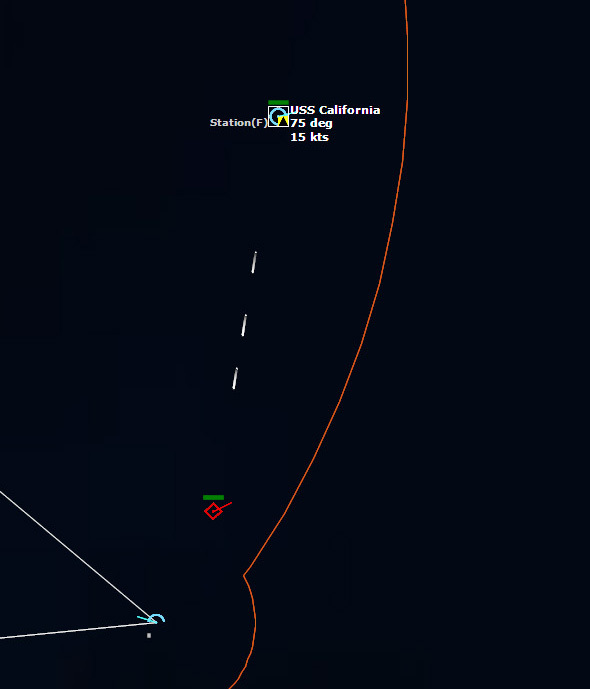 The MiGs in the area abandon my Harrier and go for the A-7s, shooting one down. 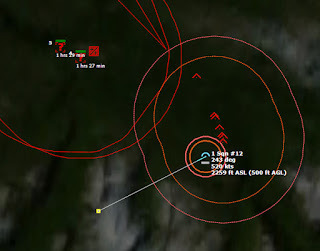 The second A-7 abandons his ground attack and shoots down a MiG with a Sidewinder. He drops his bombs ineffectively, and then heads for home. A pair of A-6s make their run on Bardufoss. They drop their 2000lb bombs on an Ammo bunker, doing light damage. 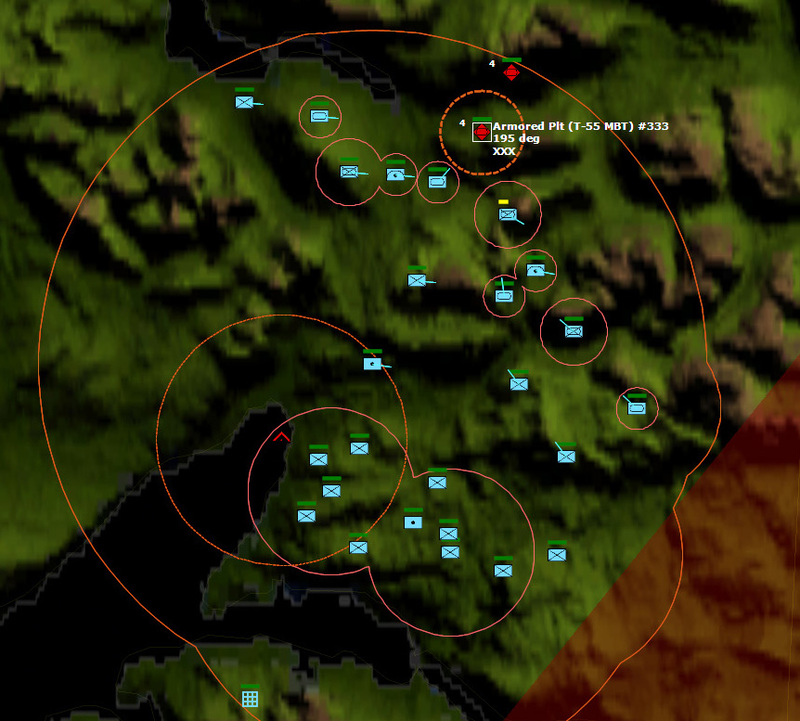 Some of my F-14s arrive on the scene and start firing missiles at the Su-15s, which decide to leave the area. One of the Flagons is shot down by a Phoenix. My second pair of A-7s arrive on the scene and completely miss with their cluster bombs. My F-14s, nearing the limits of their fuel detect some MiG-23s leaving Banak, and launch barrages of Phoenixes at them, shooting down four. An Su-15 Flagon is shot down as well. My last pair of strike aircraft, A-7s, drop their Walleyes at Bardufoss, causing more negligible damage. Instead of attacking Ammo Bunkers, I need to focus on runways from now on. 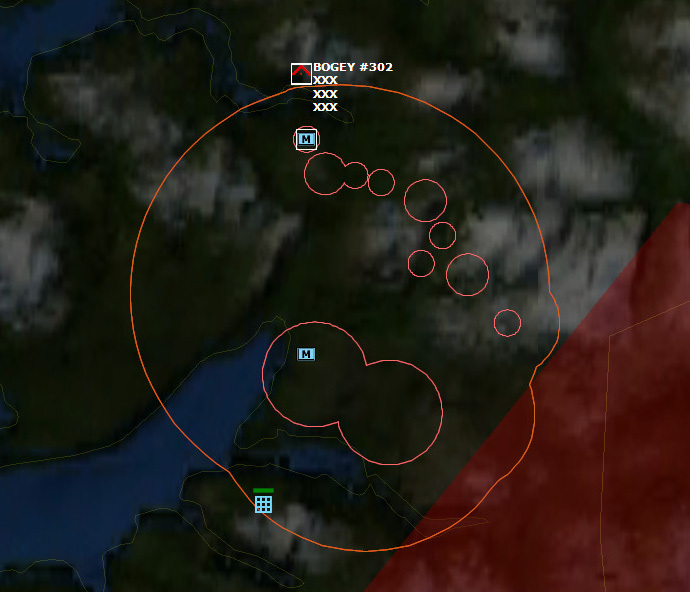 To the north, the air battle continues. Many of my F-14s are RTB Bingo, but a few are still in the fight, picking off Soviet planes. F-14s bring the fight to the enemy. Another Flagon is shot down. One of my F-14s is shot down by a Flagon--an embarrassment. 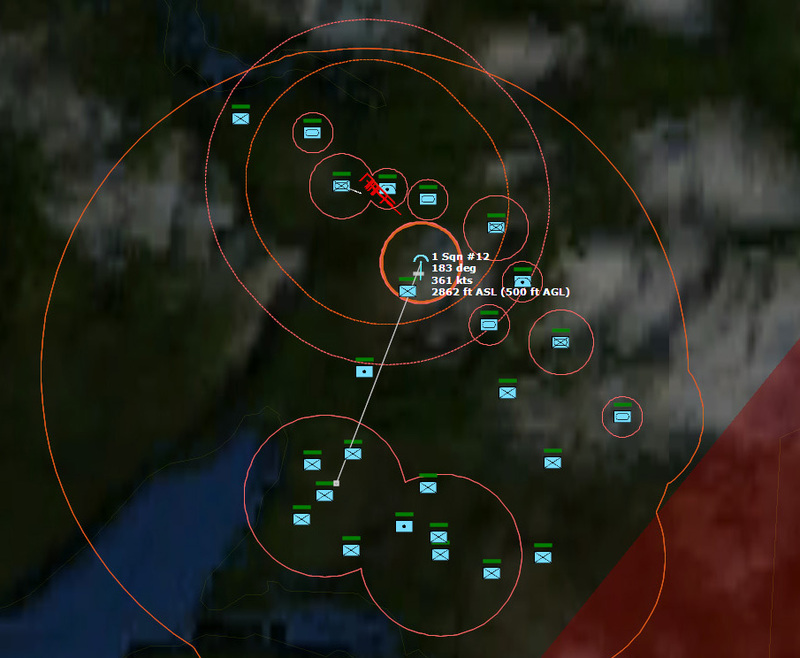 I shoot down another Flagon and dodge a few SAMs from Banak before my F-14s, all low on fuel, have to head home. 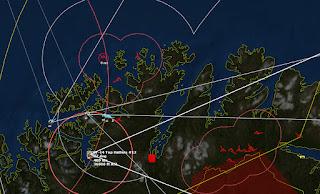 I launch another strike against Bardufoss, and as my aircraft takeoff and form up, I get reports that Soviet ground forces have engaged the NATO ground forces. My platoon of M48 tanks annihilates a BMP-1, and a platoon of M113s take out another BMP-1, and then things are happening almost too fast to follow. It is clear a furious land battle rages. The land battle rages as my tanks engage Soviet Motorized Infantry. Relatively quickly I eliminate the Soviet attack, and turn my attention to the skies again. My strikes are airborne, as are relief for my CAP. 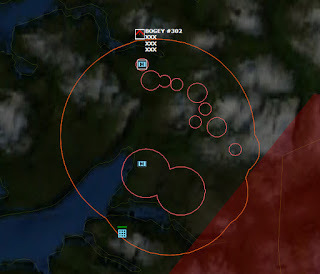 The Soviets have two Tu-95s airborne, however, and I need to eliminate them before they can detect my CVBGs. The F-14s engage the Bears. The Bears are both shot down, getting nowhere near my CVBGs. 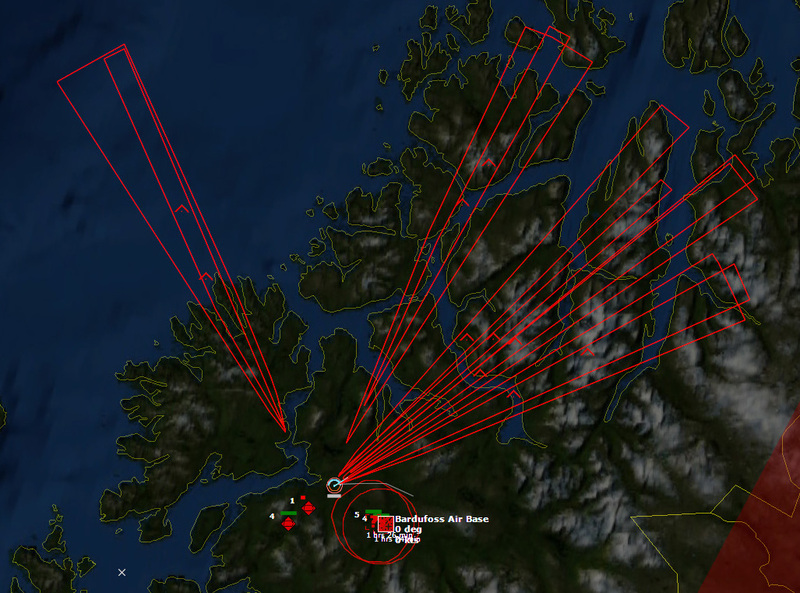 North of Narvik, the ground battle still rages. Fortunately, Soviet units seem to be arriving piecemeal, allowing my ground forces to pound them. The tanks are destroyed easily enough, but Soviet aircraft appear over the area. They turn out to be MiG-23s, circling the area but not dropping any bombs. I suspect they can't find any targets. My units shoot some AA fire, and a lucky shot downs one of them. Soon after, the MiG-23s bomb an 12.7mm AAA section, destroying it. 111107Z My strike on Bardufoss begins their attack runs, focusing solely on the runways, and led by a pair of A-7s with Mk84 2000lb bombs. 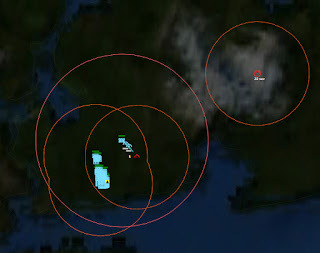 Soon after, some F-14s get in range of the MiG-23s that have been harassing my ground troops. The MiGs fly very low, and as such they frequently are masked by the terrain, causing the F-14's Sparrows to lose track and miss. Finally, one tracks and hits, but not before the crew of an M48 Patton shoots another down with its .50-cal machine gun. A while back I sent a RA-5C Vigilante on a recon mission to identify the surface contacts, and it IDs one as a Kresta I CG, the Vice Admiral Drozd. The second vessel is another CG, and my Vigilante is soon Engaged Defensive as the two Soviet vessels launch SAMs. The second vessel is a Kresta II. The Vigilante dodges the SAMs and quickly maneuvers out of range. I immediately plan a strike against the two vessels. 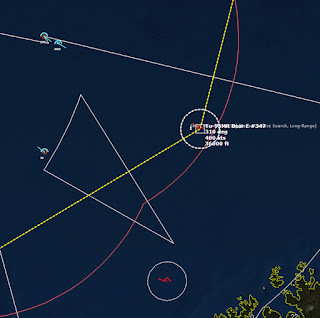 My F-14s close in to the latest pair of Tu-95 Bears launched for recon, and attacks them down just off the Norwegian coast. There are many Su-15 Flagons in the area, but none are close enough to stop the F-14s. 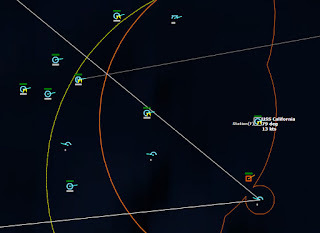 My lead Tomcat shoots down one with a Phoenix, misses the second with its Sparrows, and then closes in, and passing the Bear at close range it gets shot down by a very lucky shot by the Bear. Eventually the second Bear is shot down, and another Soviet recon element is wiped out. While searching for targets near Bardufoss, my A-7s stumble upon a SA-9b Gaskin platoon, and two of the A-7s are shot down. The second pair of A-7s promptly drop their cluster bombs on the platoon, destroying it.